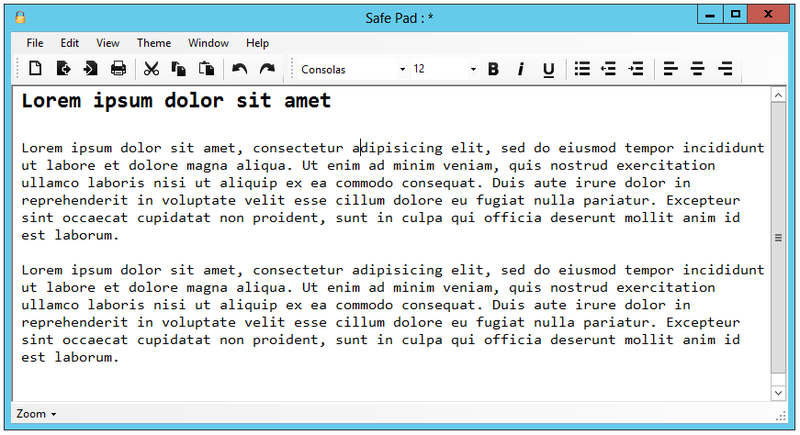 SafePad is a simple FREE text editor that lets you encrypt your documents using strong AES encryption (Advanced Encryption Standard). To protect your document you have to provide 2 passwords (The 2nd password is optional). Passwords have always been a problem when it comes to security as users tend to pick a password that is easy for them to remember. This also means that the password is most likely easy to crack. By using 2 passwords and performing multiple iterations of encryption, it makes it much harder to crack the passwords. If someone manages to crack password 1, all they will get back is encrypted text, so it would be very hard to them to know they have cracked that password. 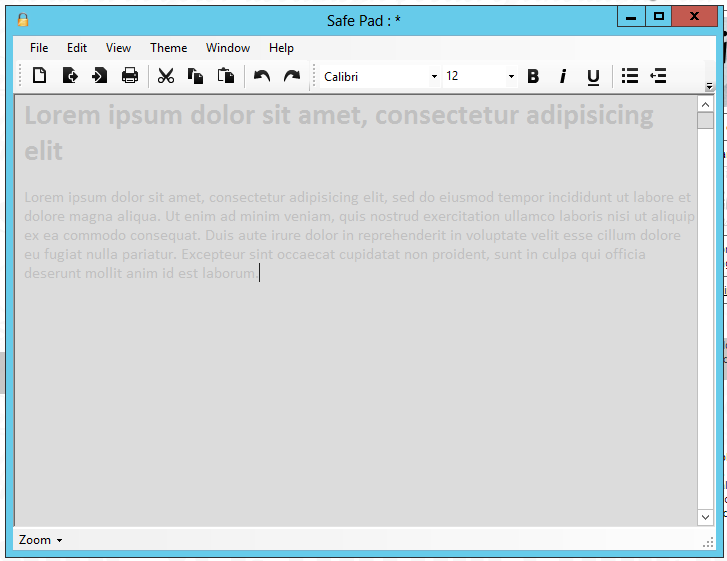 Safe Pad is a very simple program to use. The main screen resembles a normal text editor like notepad or word-pad. Safe Pad has been designed to be familiar and easy to use. The majority of the main editing controls are contained on the tool bar at the top of the screen. New Document : Creates a new document. You will be prompted to enter a password for the document. Open Document : Open up a saved document. You will be prompted to enter a password to open the document. Save Document : This will overwrite the document with the current saved password. If you want to save with a different password, use the ‘Save As’ option from the File menu. Print Document : This will send the document to the printer. Cut : Cut out the selected text and save into the clipboard. Copy : Copy out the selected text and save into the clipboard. Paste : Paste the contents of the clip board to the current cursor position in the document. Undo : Undo the last set of actions on the document. Redo : Redo the last set of actions on the document. Font Selection : This drop down box lets you select a new font to use. If you have text selected, then this will change the font of the current text selection. 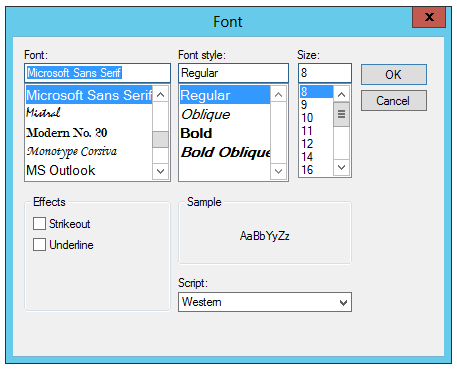 Font Size : This drop down lets you change the font size of the current font or of the current selected text. Bold : Change the current font or text selection to bold. Italic : Change the current font or text selection to italic. Underline : Change the current font or text selection to underline. Bullet List : Change the current text selection to a bullet list. Indent to the Right : Indent the selected text. Remove Indent : Remove the text indent for the current selected text. Left Justify : Justify the selected text to the left. Centre Justify : Centre justify the selected text. Right Justify : Justify the selected text to the right. All of these editing functions besides the font selection and font size are contained on the document context menu which can be access by right clicking the mouse in the document area. If you have any web addresses (URL’s) in your document you can browse to them in your default web browser by selected the link text and right clicking on it to bring up the context menu. If the selected link is a valid link, then you will see a ‘Browse’ option. Select Browse to open up the link in your default browser. 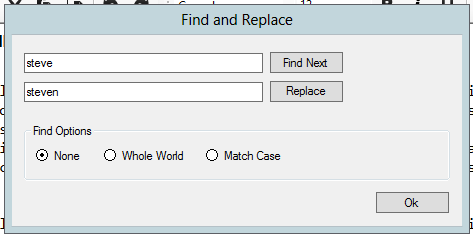 If you need to search for text in your document, or replace text you can do so from the Find and Replace dialog box. This is accessed from the Edit Menu. To find text in your document you just enter a phase into the first text box and hit the Find Next button. This sill locate the first occurrence of the text in the document. To search for any other occurrence you just hit Find Next again. If you want to replace any text in the document, first enter the text you want to find in the first text box, and then type the text you want to replace in the 2nd text box. Then hit the Replace button to do the replacement. If you want to match the case of the text you are finding, you can select the Match Case option. If you want to match a whole word instead of a string that is part of a work, you can select the whole word option. As well as using the main tool bar to change the font and font size, you can use a more detailed set of windows to do the same thing. To change the font colour, open up the View menu and select Select Color. This will bring up the window shown below. 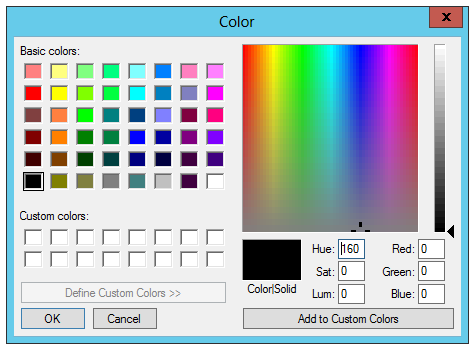 Just select the colour you want, and it will either change the default font colour, or the colour of any selected text in the document. If you want to change the font, you can select the Select Font option from the View menu. This will bring up the window below. Just select the font that you want, and it will either change the default font, or the font of any selected text in the document. When you create a new document, save a document, or load a document, you have to enter a password. You can also use a 2nd optional password. 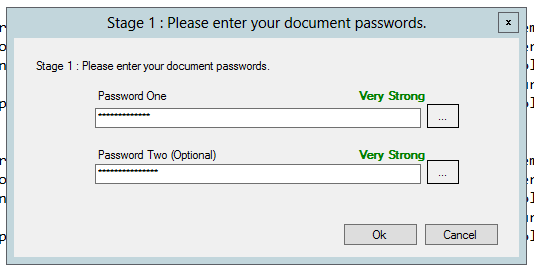 When you create a new document or want to save a document with a new password you have to entered the passwords twice to confirm them. It is very important that you do not forget the password(s) that you set for a document. If you forget them, then the document becomes unrecoverable. There is nothing you can do to access the document, except try and remember the password(s). As you enter each password, you are presented with a password strength meter. Ideally you want to aim for ‘very strong’ password. This will contain a combination of mixed case letters, numbers and punctuation. The password meter in Safe Pad also has a black list of common passwords and their variations. All passwords in this black list will be set to weak security. An often requested feature of Safe Pad was an on screen keyboard for password entry. The reason people requested this, was because they were worried about potential keyboard sniffers that may have been installed on their systems. When you are on the password entry screen, you will see a square with 3 dots in next to each password box. 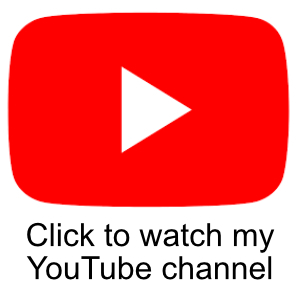 If you click on this button, you will get a keyboard like that shown below. This allows you to use the mouse to enter the password, or a touch screen if you have one. This will build up the password without sending any keyboard events. 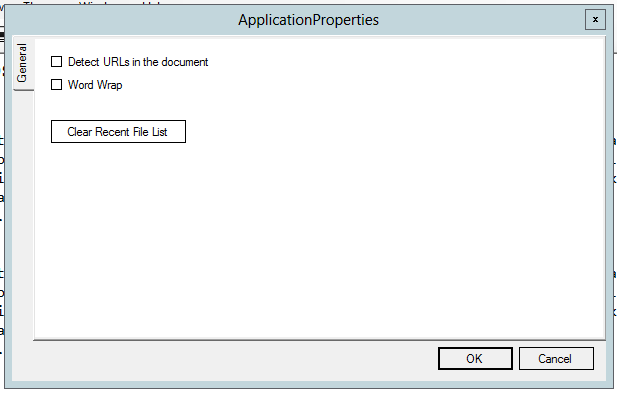 On the File menu you can access the application properties. This is where global properties are stored. Currently there are only a few available. Detect URLs in the document : This setting tells the editor whether to turn URL’s into click-able links. If you decide you don’t want URLs to be click-able, then you can still select the URLs, right click in the document and select Browse. Word Wrap : This option enables or disables word wrapping in the document. Clear Recent File List : This button will clear out the recent file list on the file menu. The primary focus of Safe Pad is to securely store your documents. This is done using strong FIPS compliant AES encryption where the passwords are run through a Password Based Key Derivation Function to create the encryption key. This is all well and good, and secure, but it doesn’t guard against people looking over your shoulder whilst you are writing your document. 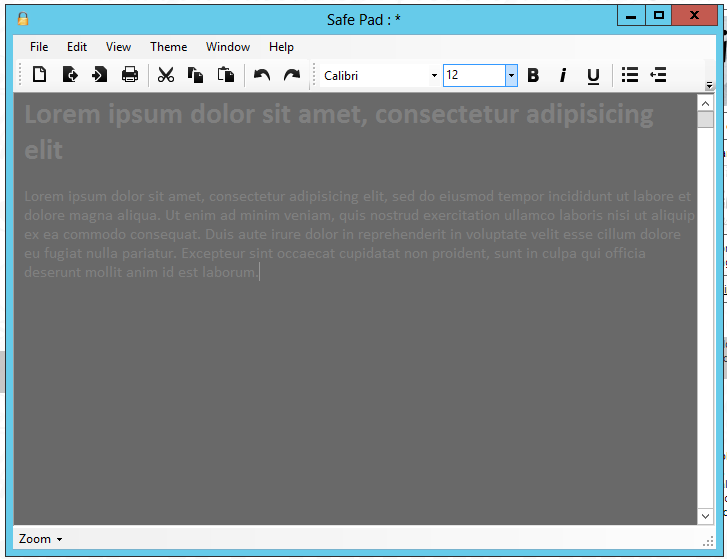 Safe Pad offers 2 low contrast themes that you can enable. These low contrast themes makes it harder for someone standing behind you or to the side to see the text on the screen. Normal : CTRL + F1 – This is a normal editing mode, of a white background and black text. Invisible : CTRL + F2 – This colours both the text and background to white. This is useful if you want to quickly make your text disappear if someone is watching you type. Low Contrast (Dark) : CTRL + F3 – This turns the background to a dark grey and the text to a slightly lighter grey (See screen shot above). This means you can still write your document, but it is harder for people near you to see what you are writing. Low Contrast (Light) : CTRL + F4 – This turns the background to a light grey and the text to a slightly darker grey (See screen shot below). This means you can still write your document, but it is harder for people near you to see what you are writing. One thing to bear in mind is that these options will loose any colouring to your text in the document. This are more like panic modes to obscure the text you are working on. If you are working on a document and someone is standing near by, you can either change the document theme as described above, or you can hit the Escape key which will quickly minimise the whole application. it is strange that after the installation an xml file was created which was seemingly promoting microsoft explorer and other MS products. Connection with the installation? Stealing password? Hi, I am not sure what you really mean? There isn’t an installer as such. It is a portable zip file. There is an XML file that is created when you first open the program, this is to store application settings like screen position etc. By default in Windows, XML files are associated with Internet Explorer which means when you open the file it will open with IE unless you have another program associated with XML files. As for stealing passwords, I can ensure you the program doesn’t steal passwords. I found that great app yesterday and I really like it. This is the software what I’ve been seeking for long time. Thanks a lot for your work. Althoug the app really good I’ve found a small bug. If I change the font colour, then I use the “Low Contrast Screen Filter”,the font will be black again. Hi, this seems an excellent tool, and thanks for writing it. not currently, but this is a great suggestion for the next version. I have been using Safe Pad for a while now and it’s great. But I’m having trouble getting into it suddenly. It keeps asking me to log in through Facebook or Google+ to recover my password. It let me in once thru Facebook but now won’t get past this screen and don’t let me in at all. HELP! I HAVE A LOT OF IMPORTANT STUFF ON THERE!! Are you sure you are using the SafePad as described in this article? Safepad is a windows application that will never ask you to log in via google or facebook!! What Key size is use? Will you add features to set your own? The AES key size is 256bits (32 bytes). I wasn’t planning to add a features to set arbitrary key sizes, but over time I would increase the key size to 512 bits. I really like this text editor you wrote. There is only a little wish I would ask for: turn on the invisible mode after a configurable duration of inactivity as a configuration option. Then it would be really perfect for me. That’s a really good idea. I will definitely consider this one.